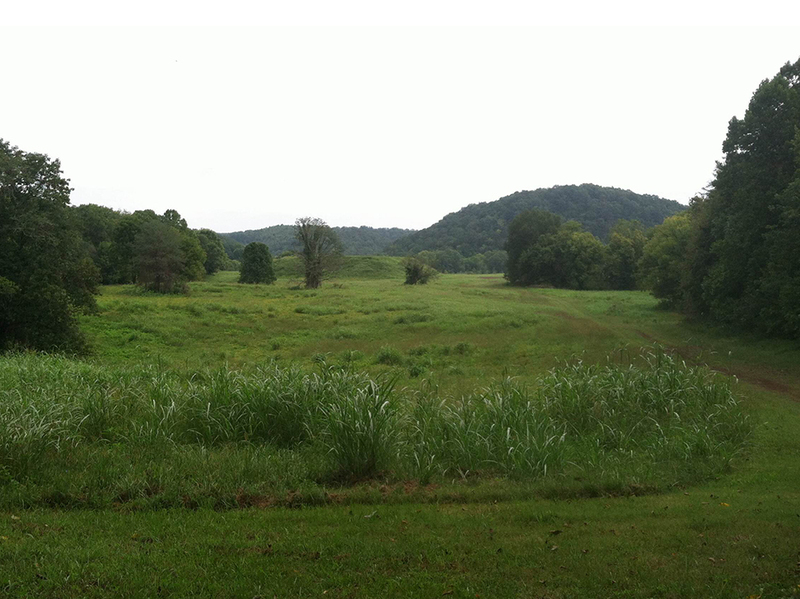 Mound Bottom State Archaeological Area is located along the Harpeth River in Cheatham County, and includes one of the largest Mississippian period archaeological sites in Middle Tennessee. 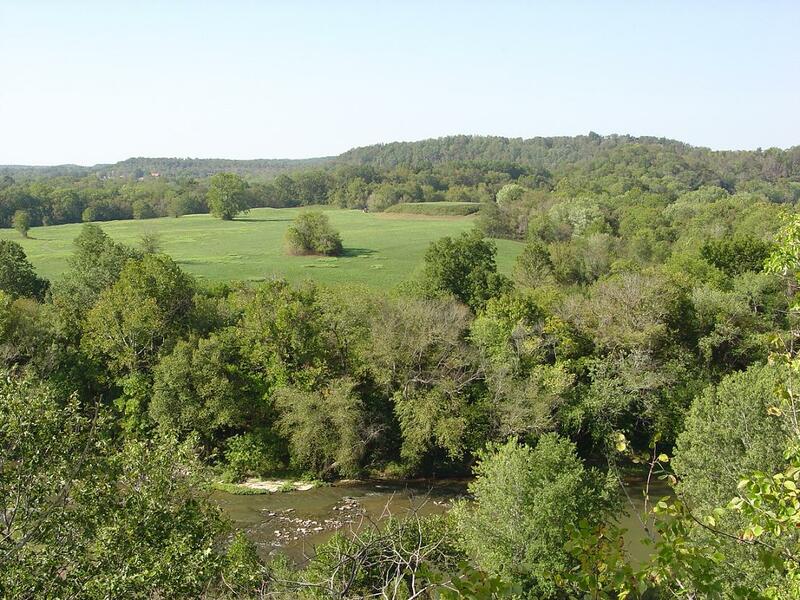 The main site area was purchased by the State of Tennessee in 1973, and in 2005 became part of the Harpeth River State Park. In 2008 an adjacent 65-acre parcel including additional site area was purchased with the assistance of Tennessee Parks and Greenways Foundation. Since the late 19th century Mound Bottom has been the subject of limited archaeological investigations including those by the Peabody Museum at Harvard (1878; link opens a large report PDF), William E. Myers (1923), Tennessee’s first State Archaeologist Parmenio E. Cox (1926), and the University of Tennessee (1936-1937). The only modern excavations at the site were conducted in 1974-1975 by the Tennessee Division of Archaeology and published in 2012 in the journal Southeastern Archaeology. View of Mound A from the site entrance, facing east towards the main plaza. When you visit Mound Bottom today you approach the main plaza from the west and are presented with a view of the rear face of Mound A, the largest of the 14 mounds at the site. Mound A measures about 246 feet on each side, and originally stood more than 36 feet tall (in an 1878 map the height is identified as 45 feet). 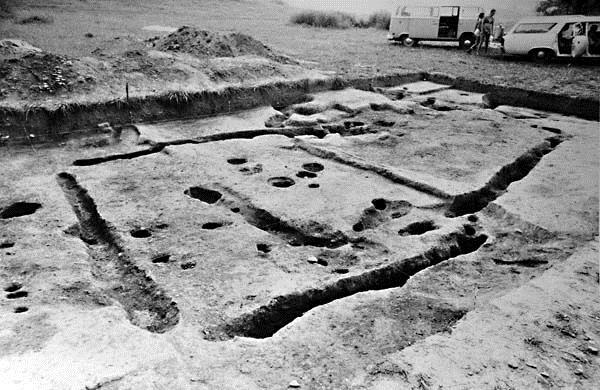 Test excavations by the Tennessee Division of Archaeology in 1974 and 1975 determined that following initial construction Mound A was enlarged in at least three stages, first around AD 976 and again around AD 1147. The upper surface of the mound originally held one or more buildings, which would have functioned as ritual spaces and/or residences of individuals with elevated social status. When the site was occupied, Mound A would have been accessed by a central stairway located at the middle of its eastern face. In late 19th or early 20th century a new access ramp was cut into the north face of the mound, and according to oral histories, the summit was cultivated as a watermelon patch around this time. The uppermost mound stage was heavily disturbed by historic plowing, and as a result the time frame for the final construction phase and layout of structures on the summit remains unknown. 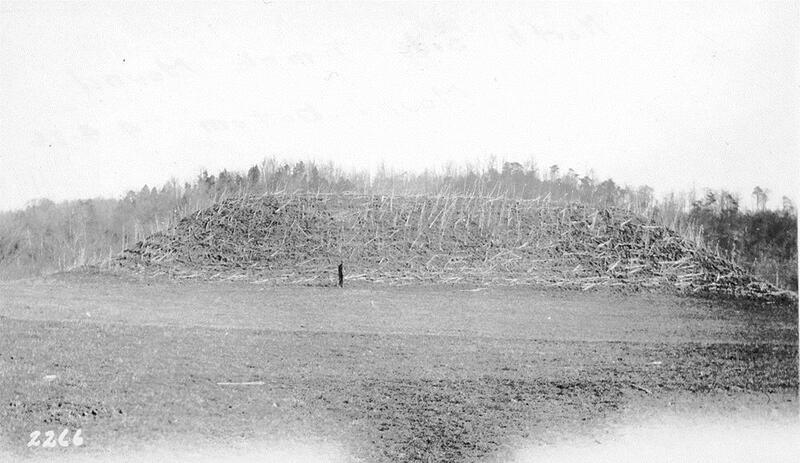 View of Mound A in 1926, planted in corn. Image courtesy the P.E. Cox papers, Tennessee State Library and Archives. The main plaza at Mound Bottom encompasses 6.5-acres to the east of Mound A and is bounded by a total of ten smaller mounds. A single mound known as Mound L is situated along the eastern edge of the plaza. Many of these mounds exhibit multiple construction stages indicating they too were improved and expanded throughout the history of the site. Today the mounds surrounding the plaza appear rounded on their summits. However, excavations have revealed that almost all of the small mounds at the site were originally flat-topped platforms. Today when we visit Mississippian mound sites we see grass-covered, empty spaces. However, in their heyday there was likely little grass to be found in these thriving centers. Plazas consisted of hard-packed earth, while the mounds themselves would have been covered in clay or in some cases colored earth. The areas outside of the plazas were typically filled with wattle and daub houses and distinct cemetery areas. Other important non-mound structures were sometimes situated within the plazas. The floodplain of the Harpeth River surrounding Mound Bottom would have been thickly planted with fields of corn, the main staple of the Mississippian diet. Excavated house footprints west of Mound A, dated to about AD 976. Image courtesy the Tennessee Division of Archaeology. 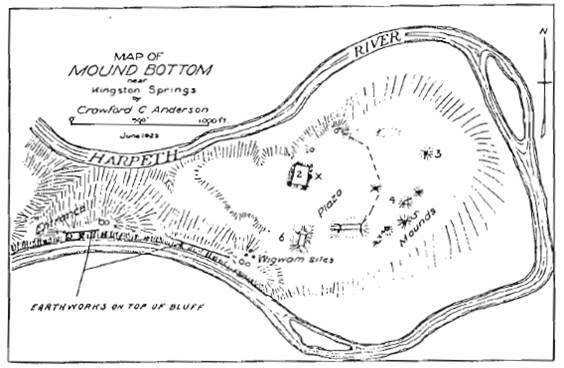 A large wooden palisade may have surrounded the Mound Bottom site area between the mounds and the river. While the presence of this feature remains unconfirmed by modern archaeology, its presence was attested to in 19th century by Judge John Haywood, who wrote: “All around the bend, except at the place of entrance, is a wall on the margin of the river. […] On the north side of the bend and wall, is a gateway, and also on the south. On parts of this wall, at the distance of about 40 yards apart, are projected banks, like redoubts on which persons might have stood.” He further describes visible traces of a road that passed through the gateways and connected Mound Bottom to the Pack Site, another multi-mound Mississippian center located to the south on private property. No modern excavations have been conducted at the Pack Site, and the precise relationship between the two mound groups is not understood at this time. View of Mound Bottom from Mace Bluff. Major occupation at Mound Bottom appears to have ended by around AD 1300-1350, corresponding with a period when numerous smaller Mississippian chiefdoms began to spread throughout the Nashville Basin. While there is still some evidence of occupation at Mound Bottom around that time (several house footprints have been dated to about AD 1350), it is believed that major moundbuilding activity at the site ceased during the late 13th century. In addition to the Pack Site, Mound Bottom is also associated with several pieces of rock art located along the same stretch of the Harpeth River. The most famous of these is Mace Bluff, which features a petroglyph incised into a stone outcrop and provides a fantastic view of Mound Bottom. You can learn more about Mace Bluff – and see the 2014 Tennessee Archaeology Awareness Month poster! – in tomorrow’s post for 30 Days of Tennessee Archaeology by Dr. Tanya Peres. Due to its sensitive nature and lack of facilities, access to Mound Bottom is by appointment only, and can be arranged through the Harpeth River State Park. The Tennessee Division of Archaeology gives periodic tours of the site throughout the year, which are announced on the Tennessee State Parks Facebook feed.